MOSCOW (Sputnik) - More and more migrants are choosing illegal routes in the Aegean Sea to get to Europe due to the proximity of the Greek islands; as many as 13,336 migrants have crossed the Aegean Sea this year in order to reach Greece, the Anadolu news agency reported, citing the data provided by the Coast Guard Command. Turkey has prevented a total of 14,470 migrants from illegally crossing into Europe in the first seven months of the year, with the number of migrants attempting to reach the continent clandestinely having increased by 60 percent compared to the same period last year, local media reported. As many as 54 attempts to cross into Europe from Turkey resulted in the death of those trying to enter Europe, which is an increase of over 50 percent compared to last year, the news outlet added. 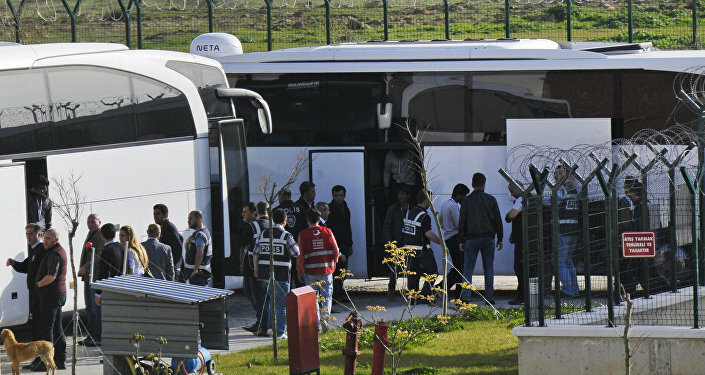 In March 2016, the European Union and Ankara agreed on a deal, under which Turkey vowed to take back all illegal migrants who come to the European Union through its territory in exchange for Syrian refugees being accommodated in Turkey, on a one-for-one basis. The EU pledged to hasten the Turkish EU accession bid, introduce a visa-free regime, as well as provide financial aid to Turkey to cover the costs of migrant reception. Europe has been experiencing a migration crisis since 2015 due to the influx of thousands of migrants and refugees fleeing crises in their home countries in the Middle East and North Africa. Hundreds of thousands of migrants are trying to reach EU states using various routes, including via Turkey, Italy, Greece, and the Balkans.